Pinus radiata bark extract 1200 mg daily in combination with vitamin C 150 mg daily – not sure why latter but one could easily just take a vitamin c capsule. Some migraine sufferers get worse on corn and citrus so might have to take rosehip vitamin C.
No response to least two prophylactic medications of beta-blockers, antidepressants, or anticonvulsant. Pine Bark Extracts: Nutraceutical, Pharmacological and Toxicological Evaluation. Journal of Pharmacology and Experimental Therapeutics (2015): jpet-114. 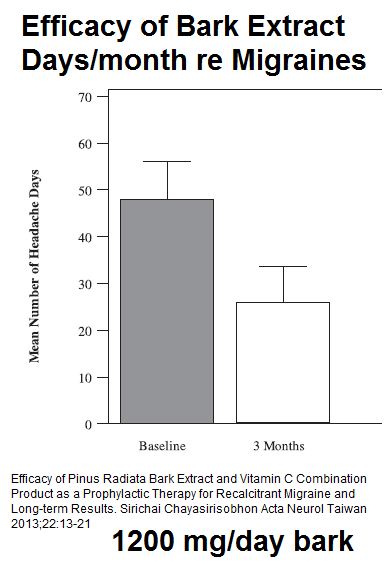 Ok, I’m willing to accept a 45% reduction in headache frequency is probably not placebo. If I’d missed any studies using less dose, let me know.